The newest revision of the Caid Rapier Rules has been approved by the Earl Marshal and posted to the Kingdom Website. We expect that they will be officially signed by Their Royal Majesties within the next few weeks, but are in effect AS OF NOW. Special Thanks to everyone who provided feedback at meetings and public forums, and especially to my C&T Deputy (and Supervising Spear Marshal)THL Meala Caimbeul, as well as my Deputies, Brian Krinsley (M. Alexander Kallidokos), Boris Smersh (M. Oliver Dogberry), the Unarmored Deputy Marshal Scott Farrell (Sir Guillaume de la Belgique) and the SRM Greg Wylie (M. Laertes McBride) for helping get everything together. Categories: Marshallate, News | Tags: KRM, Marshal, news, rules, Spears, SRM | Permalink. Darachshire, Caid – A traditionally understated and joyous event became much larger on Saturday, the second day of A.S. 50, as the Shire and Kingdom welcomed the premieres of the recently created Order of Defense. 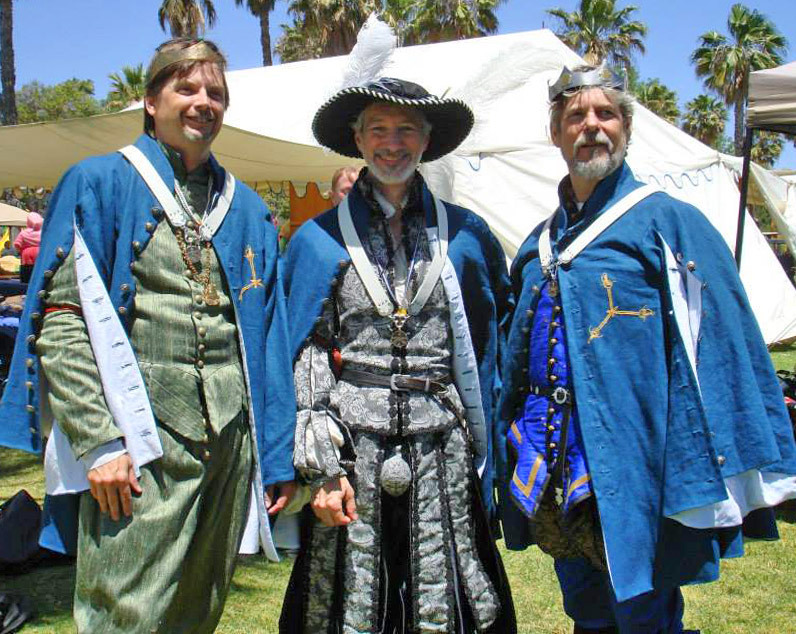 Styled as “Masters of Defense”, Baron Alexander Kallidokos, Master Laertes McBride, and Don Colwyn Stagghorn were elevated to the peerage with much fanfare, pomp, a few tears, and of course, some shenanigans. Elevations occurred at opening court, with TRM Mansur and Eilidh, TRH Athanaric and Sigridr, and a large turnout including numerous members of the Order of the White Scarf, including a few seldom seen. The event was echoed around the Known World as every kingdom elevated their own Masters, who will share precedence as Premieres of the Order. After some words from their Majesties and Highnesses, and various presentations and awards, the first Elevation was Don Alexander, who processed in with friends, family, and a seemingly endless list of awards and accolades that was both impressive and humbling. Alexander, resplendent in silver and sable, was welcomed into the Order in a moving ceremony that included eloquent and emotional recommendations from Duke Guillaume and Duchess Felinah, among others. Don Kallidokos asked to be dubbed with the sword of Don Kelan, Premiere of the Order of the White Scarf of Caid. Following Alexander was Don Laertes, adding some levity by processing in with a dialogue between two heralds, one of whom was his young daughter, proud of her father but stern in her praise. His recommendations from the peerages including a heartfelt one from his Baroness of Altavia (ret.) Bridget, declaring him the most skillful rapier fighter she has ever known. Laertes, in his customary verdant splendor, was also the first to have been spoken for by a Master of Defense, in this case the freshly Masterful Alexander. The third and final elevation (to the Order) of the day was Don Colwyn. Arriving with much fanfare (including the traditional heraldry that begins a tourney bout), preceded by Pretty Fairy Niko, and arriving on a chariot of his own creation in a glowing ensemble of azure, Don Stagghorn made what is recalled by many as the most amusing entrance of the day. The seldom serious but always genteel Don was lauded by many, including his daughter Duchess Cassandra, who declared him as being made of silliness and generosity, in perhaps unequal measure. All three Masters were presented a collar and medallion representing the peerage, and cloaks with the peerage device. In between each elevation was a bardic interlude, a welcomed touch. As His Majesty himself stated (to paraphrase): ‘…this was a rare chance to see the establishment of a new peerage, and a once in a lifetime chance to see this peerage established…’ Many felt it was an honor to be in attendance, and many were also moved by the emotion and pageantry of the court. Following the ceremonies, a team of heralds read new language regarding the rapier peerage, Order of the White Scarf, and associated changes into Kingdom law at an optional court. After court, the new Masters went to be photographed and showered with gifts, and the many rapier fighters in attendance signed up for an impressively deep rapier list. The tournament format was a variation on the “Bear Pit”, with the victorious fighter holding the field and earning a point, with the vanquished leaving to inform the scorekeeper of the victor. Four matches were held simultaneously in two erics, with a seemingly endless line of fighters in waiting. At set intervals, the weapons format changed; first single-sword, then with dagger, followed by cloak, and finally buckler. The semifinalists were those four with the most impressive record in each category. The Masters all acquitted themselves well, including Laertes holding his place for over a dozen matches in a row, with many fighters both scarfed and unscarfed putting together very respectable performances and maintaining a high energy and most importantly, very fun, tourney. In the end, Don Ian F. Duncanson was victorious over Don Michael Mallory, after winning his semifinal match from the ground. In all, the event was a beautiful day in Darach, and a fitting beginning for the Order of Defense. Categories: News | Tags: Darach, MoD, news | Permalink. Hello, I have good news and just in case you were not at the last King’s Hunt (and even if you were) please allow me to share some of the exciting things happening in our kingdom. Seeing a new Scarf being made is a wonderful occasion to behold, everyone is so happy for the new Scarf and thankful they are getting the recognition they deserve. But, when that new Scarf is a friend and fellow student it hits even closer to home as I have seen and benefited from all the hard work he has done over the past few years. He has inspired me to strive for greatness all the while working to achieve it himself. Well deserved, my friend. The bitter-sweet news is the announcement of the closing of the Order Of the White Scarf at Coronation. This is of course to make way for the new Order of the Master of Defense but never the less many people have questions as our current rapier culture relies on the White Scarves as leaders in our community. As I have been involved in many discussions about this topic with our and other leaders in the rapier community, please let me answer the most common questions I see time and time again and perhaps prevent confusion and fears on how this transition will take place. Q: What does closing the order mean? A: Simply that no new members will be made, each current member will retain all honors and regalia. Q: What will happen to existing scarves? Will they have to give their scarf back? A: Much like the answer above, nothing will happen to the existing scarves. I’m sure each of them will continue to proudly wear their regalia. Q: Will all the White Scarves get elevated to the new order? A: Not necessarily, they may eventually, but each new member will be voted on by the members of the order and new members may or may not be a White Scarf. This is due the different requirements of the two orders. Q: What about our leadership structure? Who will run events, authorize fighters, hold practice, etc..? A-1: This is really a two part answer so… First, Leadership was a requirement of being a White Scarf, but having a White Scarf is not a requirement to be a leader. Many non-Scarves are currently running events, holding practice, teaching in various styles. Quite simply not having a scarf is no excuse to not doing something for the community. A-2: Second, Our current scarves are not going away and they certainly won’t stop doing all the Scarfy things they do (like fencing, teaching, leading the community, and talking too much.) There is no reason why they would not still meet to discuss the community and do things to support it. Q: I have a teacher student relationship with a Scarf, what will happen to that; will I need to find a Master of Defense? A: Well this is between you and your Scarf, but the short answer is – nothing, if you don’t want it to. In fact having a scarf is not required to take students, I know non-Scarves with students at this current time and I doubt that will change. Q: Part of the reason I was so excited about the Master of Defense was because it gave us fencers three step award structure, doesn’t closing the White Scarf defeat the purpose? A: No, as leaders in the community are working on options for a new GOA level award. Now this is not an easy task, as for anything to become official, it must first be submitted to the heralds and passed. At this point I do not know how far along the discussion is, but if you have any ideas I highly recommend you submit your suggestion to the Crown. But, this will result in the three step structure we currently have for many of our other activities. Q: The White Scarf was hard enough to receive as it is, won’t the Master of Defense be even harder as it is a peerage? As for the reasoning on why I don’t expect it to be any more difficult; The White Scarf in Caid was treated as a terminal award, i.e. the very last award you will ever receive and was treated as such. One of the reasons for closing the White Scarf is so we would not have to lower the standards for new scarves as well as to make way for the two new awards (Masters of Defense and the new as of yet unnamed GOA award.) Now, the Master of Defense is the new terminal award and will be treated as such. Q: Will the existing White Scarves be getting the new GOA award? A: Doubtful, as they all already have a GOA award, it is unnecessary, and while it is possible for anyone to get any award at any time, people generally do not receive redundant awards for the same activity. Q: I hear that people are very upset at this news and may leave the SCA? A: While I cannot answer for everyone, the general feelings I have found expressed from most people is that they are a little bummed, but that is it. And while I do know a few people that are much more emotionally affected by this, the vast majority is nowhere near that level. Honestly, I find more people are simply confused than angry or sad. Q: How does the news make you feel? A-0.5: Ok, I expected to hear this question from my wife, and perhaps my teacher, but in the past two weeks I must have been asked this question at least 20 times in person, or online, and while I have tried to keep opinion out of this Q&A, if you really care what I feel read on. If not, skip to the next question. A-1: I’m a little bummed, but at the same time I am ok with it. I understand that unless we wanted to lessen what the White Scarves are, that closing the order is the best option. Additionally, all of us “grew up” (as far as the rapier community) hearing how awesome the White Scarves are, that they were leaders, highly skilled, teachers, and good well liked people that we wanted to represent our community. And, they did all of that and they were our heroes because of it. But now we have the chance for our Heroes to be recognized, not just by us fledgling fencers, but the rest of the SCA as well. And for that mental shift to happen for new fencers, we have to be able to let go. Nobody said it would be easy, but for the new fencers coming in now, it is necessary for them to be pointed in the right direction, and it is our job as non-Scarves to lead them. Remember the White Scarves are not going away, and there is not any reason for any of them to stop what they are doing. Their Majesties had the very difficult task of taking all the commentary from the populace and decide what is best for the community as a whole in the long run. I truly appreciate all the hard work and effort their Majesties put into this decision and I will be sure to express my gratitude to them for taking the necessary time and energy that this decision demanded. We are not losing the White Scarves, they are not going anywhere, but we are gaining the opportunity for our teachers, leaders, heroes, and friends to be Peers. However much I enjoy growing and supporting the community, I can’t imagine burden to make that decision myself. Remember when I said I would finish with good news, the good news is this: The Order of the White Scarf is closing and in its place we are getting two new awards, the Order of the Masters of Defense and the new GOA award. Now, we will have the opportunity to see many new friends and heroes get the recognition they deserve. Right now in Caid (and across the Known World) history is being made, on not only how our game will be played, but how we show our appreciation to those that make our game into a dream we can all share. How we react and we shape the events within the next year will set the precedence, standard, and traditions that will be upheld in our community for years to come. Categories: Editorial Articles, News | Tags: GoA, MoD, news, White Scarf | Permalink. Please see the post from the Society Rapier Office regarding updated rules for New Blade Testing Procedure. Categories: News | Tags: blades, news, SRM | Permalink.